Although, they are both cleaning agents, they do not belong exactly to the same product category. Yet Harpic and Hypo, are slugging it out in the battle to win consumers’ mindshare as it pertains to keeping water closets spick and span. Harpic is a cleaning agent designed for washing water closets while Hypo is a bleach solution made primarily for washing clothes. However, makers of Hypo have in marketing their product, built associations of the product with not just being a stain-remover for clothes but a cleaning and disinfecting agent for water closets (WCs), kitchens sinks, bathtubs and floors. These associations built through massive investment in TV advertisements (which show sparkling toilets and tubs), radio jingles, outdoor and word-of-mouth has won Hypo more usage outside its catchment area. Interestingly, Harpic’s supposed competitors, that is, brands in its market category like Duck and Mr. Muscle produced by SC Johnson, makers of Kiwi Polish, Glade and Raid, are clearly lame ducks in the market today. Harpic is insulated from any threat from them as they are hobbled by low brand awareness and their poor choice of trade channels. Instead, Harpic’s share of the market that it had created over the years has been receiving devastating punches from Hypo, a seemingly featherweight fighter, judging from its parental pedigree. Hypo is produced by a little-known logistics company called Multipro Enterprise Limited. Multipro Enterprise Limited, a sister company to Dufil, makers of Indomie, and this is the group behind the sale and distribution of Indomie Instant Noodle. They also run Best Choice, a minimart chain. On the other hand, Harpic is a product of Reckitt Benckiser Reckitt Benckiser, a conglomerate that has been in the Nigerian market for some 35 years. Operating in a sub region as Sub-Sahara Africa which has one of the world’s highest burdens of infectious diseases like diarrhea and malaria, the company with a bias for healthcare and personal care products has made a success of selling products that deal with the region’s commonest problems with strong brands such as Dettol Liquid Anitseptic, Dettol Soap, Mortein, Jik, Robin, Drummer Air Freshener and Harpic. As a pioneer of sorts in the market, Harpic first had to build a consumer consciousness of his need for a toilet cleaning solution. Apart from advertising, it put money into celebrity endorsement, using the likes of Osuofia (Nkem Owoh), Joke Silva, Chioma Akpotha and lately, Tatafo (Helen Paul). It also did a bit of experiential marketing where its brand ambassadors pay surprise visits to homes to give consumers firsthand experience of the brand. Harpic has been harvesting from this investment in brand awareness creation as it has now built a cult of loyal patrons. 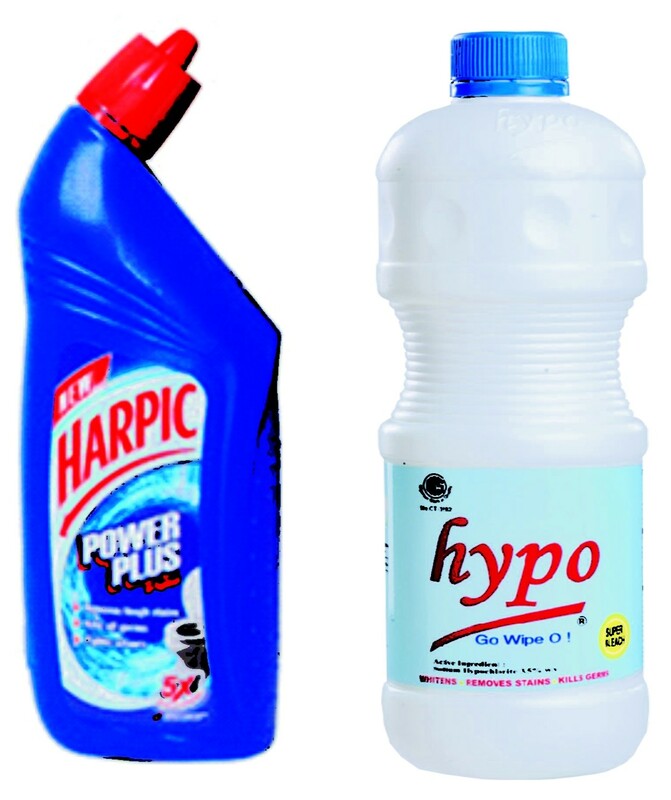 One of them, Faith Adepoju, remarked about the current competitive atmosphere: “Hypo is very good but Harpic is the best.” Another Harpic consumer, Daramola Owolabi, also spoke of the brand in the positive: “We use Harpic. It is fast and active. It cleans everywhere and makes the toilet whiter and fresher. It is more hygienic than Hypo. I have tried Hypo. Hypo cleans the toilet but it is harsh,” she concluded. However, increasing economic crisis is forcing consumers to switch to cheaper alternatives like Hypo. With the shrinking economy and the associated slide in disposal income, pricing is increasingly becoming a deciding factor that is guiding consumers’ buying decision, owing to what analysts call the ‘income effect.’ The worsening economy occasioned by the slump in oil price and value of the Naira has led to a drop in disposal income among Nigerians such that a significant number of consumers are switching from the patronage of premium products to economy products. Business Hallmark checks revealed that a cross-section of the middle and low-income populations in Nigeria are switching from Harpic to Hypo for their toilet cleaning for economic reasons. A survey of consumers aged between 20 and 50 years in Berger, Ogba and Ketu in Lagos revealed that 53% of those surveyed use Harpic for cleaning their toilets, 40% use Hypo while 7%, use detergents. The survey revealed that choice is more of a function of income bracket: While much of the middle-class patrons swing between Harpic and Hypo, the poor use Hypo while the very poor, most of who live in face-me-I-face-you enclosures use detergents. A shopkeeper at Ogba, Mr. Ik Ugwu, confirmed to Business Hallmark that many users of Harpic are switching to Hypo. “Most people use Hypo and other bleach in the market to wash their toilet. So, Harpic is not as fast selling as it used to. Some customers even say it removes stains more than Harpic. Price is also an issue because Hypo is cheaper and more effective than Harpic. So, why buy a more expensive one when you can buy a more effective one for less? queried Ugwu who revealed that even he uses Hypo in his home. An official of Multiple Enterprise Limited, makers of Hypo who would not want to be named said that they had since found out that consumers of toilet cleaners are switching to Hypo due to its quality and affordability. “It has to do with the quality of Hypo. Again, our product is also most affordable,” he said. The Brand Manager, Harpic, Ebun Longe, who acknowledged the growing demand for toilet cleaners in economy packs said that the company has responded to consumers’ need for Harpic in economy packs with Harpic in the 200ml pack. “We conducted a market research and found out that our consumers want the economy pack. We responded to the feedback. There is an economy pack. We now have a 200ml Harpic which goes for N170,” she added.